Hair loss is a problem that is experienced by more people than you can imagine. Men and women both fall victim to hair loss for various reasons, including, but not limited to poor diet, vitamin depletion of pregnancy, stress, hormonal imbalances, age, and genetic predisposition. Fortunately, Therapy Hair Studio has many products available that will help replenish your hair and give you fuller, thicker coverage without costing you a lot of time and embarrassment. Here are some products that Therapy hairstylists Sulieman Telfah and Erin Conley recommend to their clients. Quickly produce visually fuller and thicker looking hair. 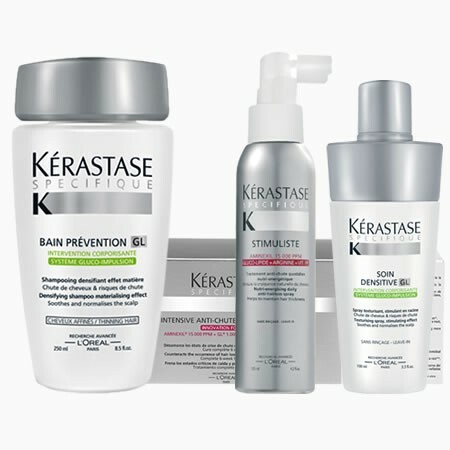 Erin Conley recommends the full gambit of products by Keratase’s Specifique line for those experiencing hair loss issues. Her favorite product in this line is the Intense Scalp Treatment, which quickly produces visually fuller and thicker looking hair and can be used as a daily regimen at home. She also highly recommends Revita.cor’s extensive range of shampoos and conditioners. They use bio-adhesive technology which is on the front lines of science-driven help for hairloss. The conditioner is designed to work for over 12 hours after application and rinsing. Add Volume and decrease hair loss from shedding. Lead stylist Suli is an avid fan of Keratase’s Densitive spray, which also acts as a texturizing spray that adds volume to the hair and helps decrease the amount of hair lost from shedding. Suli suggests that hair loss problems should be approached and solved from both inside and outside the body. 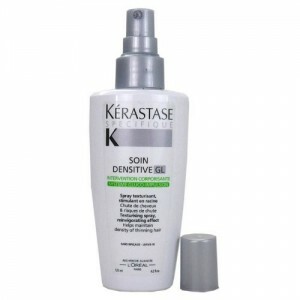 He likes to suggest the Densitive spray used with the Keratase Desensi-recharge vitamins. This has proven results for his clients. In some cases, clients that have lost hair to a point that they are uncomfortable and want instant results opt for a wiglet. Wiglets provide instant fullness at the crown. A wiglet is an oval hair piece, we use the ones made of human hair. Our stylists weave them into your natural hair to provide a completely flawless look. The stylists work with the clients to learn to apply them at home. 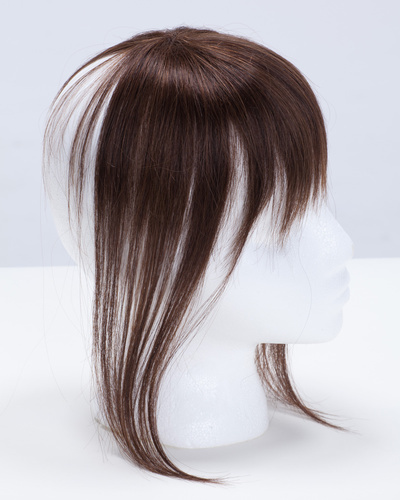 The wiglets are ordered and color matched to blend in seamlessly with your cut and style. Whatever the hairloss problem make sure to discuss your concerns with your Therapy hairstylist to help determine your best option.